San Blas sums up the very essence of the Riviera Nayarit with a touch of history that dates back to the 18th century—and before! When you arrive, head up to the Cerro de Basilio (Basilio Hill) for a visit to La Contaduría, considered the most important business, goods and cultural exchange crossroads between the Americas, Asia and Europe—there’s a museum for you to enjoy, as well as some petroglyphs. Continue your tour at the Muelle de San Blas, the local dock, and ask about the infamous La Loca (The Madwoman), who inspired a hit song by the group Maná. 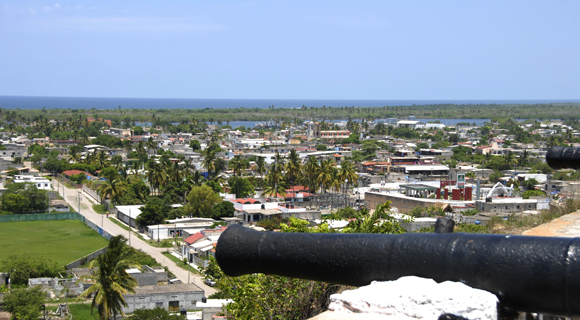 Other attractions include the “U” de Pescadores (Fishermen’s Inner Harbor), the Escuela Náutica (Naval Academy), the Casa de la Cultura (Cultural Arts Center), and the Iglesia Antigua (Old Church). Become one with nature with a visit to La Tobara, followed by a stop at the Cocodrilario “Keikari”—you’ll be sure to see several species of flora and fauna. On your way back to the sea, stop to take a peek at the crocs in the estuary, then continue on to the Stoner Surf Camp to rent a board and hit the waves. Thirsty afterwards? Relax with a few Cocos Locos. Take to the water for a visit to Piedra Blanca at the Isla del Rey, also known as Tatéi Haramara—“the place where the soul and the spirit are born”—a sacred space for the Wixárica people. Seek out an encounter with the whale shark, the largest fish in the world and one you can swim with peacefully. Chef Betty Vázquez, the Riviera Nayarit’s Culinary Ambassador, is all about food that goes from “sea to table.” Experience oysters fresh from the waters of Aticama at El Delfín, taste the lisas tatemadas (roasted fish Nayarit-style) at Los Cocos, or a delicious aguachile (shrimp cooked in lime juice with chile and onions) in Santa Cruz de Miramar. Visit the beachside restaurants at El Borrego beach, Matanchén or Las Islitas, where you can try the local banana bread or the smoked Marlin or Sailfish. This is the best place for bird watching in Mexico, a great option during the winter months when over 500 endemic, resident and migratory species gather here. There are plenty of observation routes to choose from: La Tobara, Tecuitata, Singayta, Vena del Diablo, La Bajada, Isla Isabel, Chacalilla, La Papalota and more.